Federal retirement expert, Chris Kowalik, shares important details on the differences between federal employee pay raises and federal retiree cost-of-living adjustments (COLAs) to pensions. Scott: Hello, and welcome to this episode of FedImpact, candid insights on your federal retirement. I’m Scott Thompson with myfederalretirement.com, and I’m here today with Chris Kowalik of ProFeds, home of the Federal Retirement Impact Workshop. In today’s episode, we’re going to be discussing the differences between federal employee pay raises and retiree cost of living adjustments, also known as COLAs. Chris, it’s so good to have you again with us today. Chris: Great, thanks so much, Scott. Hopefully, today’s episode will bring a little bit of clarity to this topic that I always seem to get so many questions about in our live retirement workshops, so very excited to be here. Scott: Good, yeah, and we get a lot of questions about this, too. I’m hoping today’s episode gives us some much needed delineation between the two types of pay challenges. If it’s okay, could we get a baseline of what a typical federal employee’s pay looks like today? Chris: Yeah, so an employee might receive a wide variety of different types of pay, depending on their job and the work that they do. To establish a baseline, let’s zoom in on two types of pay that the vast majority of employees receive. That would be regular pay, so that’s what’s on the normal pay table. Chris: Then we have locality pay, which is a geographic adjustment based on where employees live. In the more expensive areas, the New Yorks, the Chicagos, the DCs, the LAs, of course those big ones, those employees living there are going to receive more pay. Those end up on the locality pay table. The vast majority of employees that we’re really working with are receiving some sort of locality pay. Scott: Okay, well, like everyone else out there, I imagine that our listeners probably like when their paychecks get a little bit bigger. Scott: As federal employees, when does that happen, or how does that happen? Chris: While an employee is working for the federal government, of course, they’re hoping for pay raises over time, and the higher, the better. There are a couple of ways that that can occur. The first would be if someone gets a promotion. They go from a GS9 position to a GS10 position. They take on more responsibility, they get paid more. Another way is that they get step increases. Let’s say someone is a GS13, and they go from the various steps, so those within grade increases, as some refer to it as, a WGI. The third way that pay can really change is annual pay raises. Now, the part we’re going to really talk about today is the annual pay raise part. Scott: Okay. With respect to pay raise, who gets them? How are they determined? And when are they applied? Chris: As far as pay raises are concerned, they’re only applied to employees who are still working, not to retirees. There’s a very clear delineation of who gets pay raises. The annual pay raise typically occurs at the beginning of a year, but of course, it’s possible that one could occur at any other time during the year. With these pay raises, these could be very political. Depending on which party controls the White House, the House of Representatives, the Senate, pay raises can be really a controversial topic, especially when it’s concerning federal workers. That is not what we are going to talk about today. What we’re going to talk about is the financial aspects of this. My point to telling our audience that this can be political is that I want them to realize that pay raises are not set in stone, based on certain economic conditions. It’s not like if the economy is doing this, then federal workers get this. That is not the way this goes. It is very possible that employees experience inflation in a given year, so things around them might get more expensive, but they have no pay raise authorized for that year. To give a little bit of an idea, I’m sure our listeners today, in the not so distant past, were in a position where they didn’t get pay raises for three years. Even some groups were longer than that. Postal workers went for a longer period without getting pay raises, so 2011, ’12, and ’13, there were no pay raises for employees that were authorized. Again, everything around them is getting more expensive, but their pay’s just not keeping up with how expensive those things are. Normally, these pay raises are determined at the end of a given year, and they’re applied the following January in the very first pay period of the year. Scott: Okay, now how would this be different for federal retirees? Chris: Retirees are going to operate under a completely set of different rules, as far as how their check changes each year. To be clear, retirees are not affected by the annual pay raise that I just described. Chris: That was only for employees. For retirees, they receive a CSRS, or a first pension, and that pension will change over time, based on economic conditions. There’s factors that determine how that’s going to come up. There’s a formula to get this number, so it takes, really, that political nature out of the equation. The president does not sign cost of living adjustments, or increases to the retiree’s pension. Congress doesn’t approve it. It just happens. Again, it’s only for retirees. Scott: That’s interesting, because it is so different than what they have experienced while they’ve been working over the years. What determines the calculation? Who figures it out? Isn’t it called something different for retirees, too? Chris: Yes, so for retirees, this change in pay is called a COLA, or a cost of living adjustment. We never refer to this change in pay as a pay raise for retirees, because that is very different, and we don’t want there to be any confusion between the two. Chris: As far as who calculates it, every year, the Bureau of Labor Statistics releases a number called the CPIW. What that acronym stands for, it’s a really long name, the Consumer Price Index for Urban Wage Earners and Clerical Workers. You see why we give it a nickname, CPIW. Chris: This CPIW is essentially … The way it’s described to the average person out here is, the Bureau of Labor Statistics has set a basket of consumer goods, whether that’s gas, whether that’s other forms of transportation, food, all of these different things that the average consumer purchases. They basically watch the cost of those goods over time. That determines how much the economy has changed. Chris: The CPIW, this number that the Bureau of Labor Statistics releases, is expressed as a percentage. It’s that percentage that is used to determine the change in a federal retiree’s check. Scott: Okay. Since we have two different retirement systems, the CSRS and FERS, is the COLA applied the same to both groups once they’re retired? Chris: Great question, and the answer is no. CSRS retirees will always get whatever that CPIW number is. But FERS retirees typically get some sort of variation of that number, which of course, is lower. In our workshops, we tell our attendees that CSRS retirees get COLA, and FERS retirees get diet COLA. Scott: Okay. 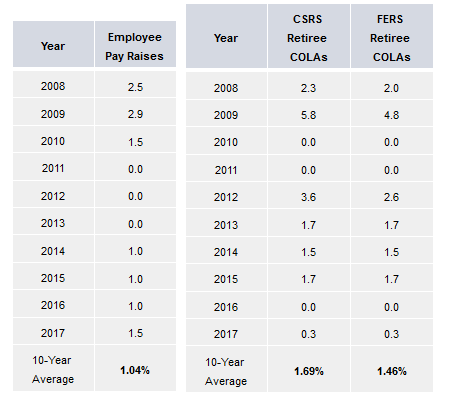 If we were to look backwards to the last 10 years, could you give us an idea of how CSRS and FERS retirees’ COLAs compare to one another? Chris: Yeah, over the last 10 years, CSRS retirees have averaged an increase of about 1.69% each year. And FERS, that number is 1.46%, so FERS are a little bit further behind than the average CSRS employee. Scott: Okay, and we talked before about while someone is still working that there are some years they didn’t get pay raises. Is the same thing possible for retirees, or do they always receive a COLA? Chris: I wish I could say that retirees always received an increase to their pay, but the reality is, is some years there are no changes. Chris: For instance, in 2010 and 2011, there were no increases to a typical retiree’s paycheck out in the CSRS or FERS world. These things don’t really correspond with one another. A big point that I want to make to our listeners today is that oftentimes employee pay raises and retirees’ COLAs don’t coincide with one another. Retirees might get a big increase to their pay in their retirement check, but employees don’t get anything that year, and vice versa. Scott: Okay. In your live workshops, I’m sure you get a lot of questions about this topic, and I can certainly see why. Are there any other questions you get surrounding this very topic that you could share with us today? Chris: You bet. This is a little bit of a side road that we take, so we’re going to rewind to something I mentioned at the beginning, which was about locality pay. The question I often get is, do I still get locality pay as a retiree? The technical answer is no. Locality pay is reserved only for employees. Remember, that was the geographic pay based on where someone lived and how much extra money they got in their normal paycheck. Chris: That only happens for employees. However, when an employee is preparing to retire, and they’re getting all their numbers together, one of the figures that will be calculated is called the high three average salary. This figure will be used in the calculation of the CSRS in the first pension. Chris: The high three does include locality pay, if it’s included in an employee’s highest three years of earnings. Let me give you an example. I live here in the Chicago area, and there’s a pretty significant locality pay here. If I were a federal employee, and I earned my highest three years of consecutive earnings, including locality pay, here in Chicago, then my pension would be calculated essentially giving me credit for that locality pay. Chris: But once I’m retired, if I later decide to leave Chicago and move to an area that’s much less expensive, that maybe doesn’t have locality pay for those people who are still employed, then my retirement pay doesn’t go down. Unfortunately, the same can be said if the opposite happens. If I earn my highest three years of earnings in a location that does not have locality pay, and that is what my pension is based on, but then if I later move to an expensive area as a retiree, my pay does not go up. Chris: I can, in good faith, say that locality pay is not applied in retirement, but what I really want to drive home with our listeners today is that it can be included in the initial calculation of the pension, but that’s it. Where you decide to live in retirement will not really impact the retirement check you receive, and that can either be good or bad. Chris: I suppose it depends on the situation that they’re in. Scott: Yeah, that’s right. Thanks, Chris, for helping us understand the great distinction between retiree COLAs and employee pay raises, and also that little nugget you threw in for us about the locality pay, and what that means for retirees. That’s really good. Again, so happy to have Chris Kowalik of ProFeds with us today. We invite you to stay tuned to the FedImpact podcast to get straight answers and candid insights on your federal retirement.